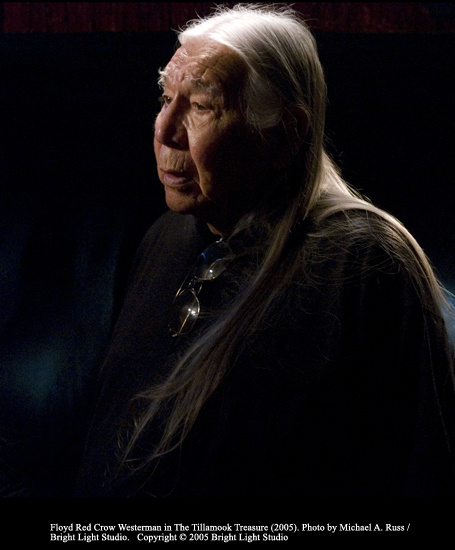 Floyd Red Crow Westerman, an American Indian activist, actor and folk singer who appeared in “The Legend of Tillamook's Gold ” as Standing Elk, died at the age of 71. Floyd was introduced to us by is long time friend, Max Gail, who played Grandpa Jack in the film. Floyd’s performance was powerful and sublimely understated. In the short time we knew Floyd, he was always the gentleman, in all senses of the word. In the film, his character, Standing Elk takes Julie (Suzanne Marie Doyon) under his wing, guiding her on her quest. In real life during the filming, Floyd did the same for Suzanne, gently guiding her to a deeper understanding of her character and a better performance. His on-screen character never tells Julie what to do but rather asks questions that leads her to discover the truth for herself. He did the same in his mentoring of Suzanne and also for the producers and director of the film. One day, for example, he was sitting in a cabin in Oregon with producer/writer Richard Doyon and Max Gail and asked Doyon, “How does Julie get the power to do what she does?” When Doyon gave a not-so-satisfying answer, Floyd nodded his head in thought and, instead of offering criticism or the “right answer”, he asked the question again. Finally, through a slow process of discovery, Doyon came up with the idea for a vision quest scene which ended up being one of the most powerful and beautiful scenes in the movie. Floyd appeared in dozens of movies and television shows, including many appearances as Uncle Ray Firewalker on "Walker, Texas Ranger" and George Littlefox on "Dharma & Greg." He is most well known for his role as Ten Bears in Kevin Costner's 1990 Oscar-winning Western film, "Dances with Wolves." He made his movie debut in 1989 in "Renegades," playing the father of Lou Diamond Phillips' character. He was a shaman in Oliver Stone's 1991 movie "The Doors." He completed shooting in September on an upcoming Costner film, "Swing Vote." Floyd was popular musician who worked with Willie Nelson, Bonnie Raitt, Harry Belafonte, Jackson Browne and others. His debut album, released in 1970, was titled "Custer Died For Your Sins." Last year he released "A Tribute to Johnny Cash" which was nominated for a NAMMY Native American Music Award for Best Album of the Year. Floyd was an activist for environmental causes, and for the rights of American Indians and other indigenous people. In the 1990s, he toured the world with Sting to raise money to preserve rain forests. Red Crow will be missed by his friends, family, and fans. We are grateful for his fine work in our movie. It is a much better film becasue of him. Photo by Michael A. Russ / Bright Light Studio. Copyright © 2005 Bright Light Studio.